Generations of Galwegians will know the deep pleasure of stepping through the doorway of Griffins Bakery and inhaling the delicious aromas of its freshly baked breads, cakes, and pastries. That tantalising joy of heady fragrances is further fulfilled when one then gets to taste the wares. Yum, yum, and thrice yum! On August 1, Griffins Bakery celebrates 100 years of business in its Shop Street premises and, ahead of that landmark occasion, today’s family standard bearer, Jimmy Griffin, sat down with me to reflect on the proud history of this much-loved Galway business. 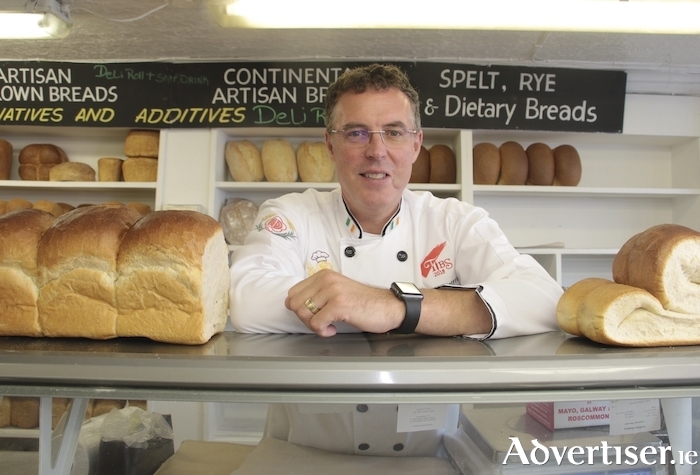 “The two founders of the company were John Griffin and his father; they began a small bakery in 1876, beside where Colleran’s butchers is now,” Jimmy tells me. “John, who was my great-grandfather, was the real entrepreneur of the family. His first wife died and he then married a lady, whose surname was also Griffin, from a family of builders. They got a property next to where Busker Brownes now stands. That became a large wholesale bakery, at one stage it was the largest in the west of Ireland. Back then there wasn’t much transport infrastructure road-wise and a lot of goods and services came into Galway via the port; spices, American flour, and so on. "John supplied fresh bread to the barracks in Renmore, the poorhouses, the hospitals, and he had contracts with the navy also because Galway was a naval port during WWI – ships from the North Atlantic Fleet used to call in and he’d supply them with bread. He built a big commercial bakery and, funnily, his slogan at the time was ‘Machine-made bread’ which projected the image of a more clinical, cleaner, environment for bread-making than hand-made bread, whereas today artisanal bread is considered more desirable. While some things have endured others have evolved. “Where it has changed a lot is the sliced pan,” Jimmy reveals. “In the past we would have made a lot of sliced bread and it was bought in large volumes. Back in the 1950s and 1960s families were larger and people ate more basic food than today because options weren’t available. Families have since got smaller and the consumption of bread has dropped a lot. "In recent years we’ve also had publicity around celebrity diets like being gluten free and people jump on that bandwagon. For a while bread and gluten got a bad reputation; there may be genuine reasons why people have problems digesting modern bread and the main one is that factory-produced bread that you get in the supermarket doesn’t have long fermentation time. They use an intensive mixing process with additives to speed up the fermentation process. As a result of that the yeast doesn’t get time to break down the gluten, so when a person eats that bread it is more glutenous. A few years ago Jimmy gave an interview to The Irish Times where he candidly admitted that Griffins Bakery was in serious jeopardy due to the recession. Has the business come through that perilous spell? “I wouldn’t say we’ve come through it but we are still swimming through it,” he answers with a laugh. “There is a lot of spin-doctoring going on that we are out of the recession and everything is great but the reality is different. A baker friend of mine in Clifden, Cathal Welsh, has to close for a few months every winter because there is no business and Galway is getting very like that. We have the massive tourist influx in the summer but in winter it is very quiet and it is very difficult to keep the door open and the bills paid. The recession hasn’t gone away in Galway as I see it.